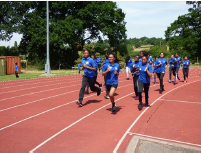 The Whitmore annual Sports day was held at Bannister Stadium on Tuesday 18th July. Years 7, 8 and 9 pupils had been preparing over the previous weeks, sorting their teams and producing their form banners ready for the competition. The opening ceremony saw every form parading their banners up the athletics track and presenting them to the crowd on an unprecedented summer’s day. Deputy Headteacher, Mr Rebbitt, was the overall judge, with the winning banners from: 7RN, 8CH & 9EN. Thank you to all forms for the great effort put in to the banners this year and well done to the winning forms who gained an extra 20 points added onto their form’s total. 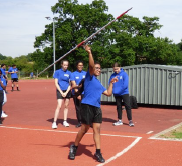 The weather started off glorious, and continued throughout the day which is a very rare occasion for sports day but made the day very enjoyable. 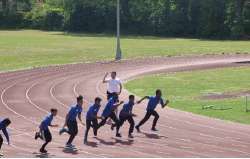 There were great performances on the track and field with a large amount of sports day records being broken from all year groups. Students conducted themselves so positively, showing great spirits, and there was a fantastic atmosphere around Bannister stadium. Students were cheering and supporting one another, with forms getting competitive against each other.